There are a number of products that can be used to clean stinky towels, including ones you probably already have around the house. This is a guide about cleaning stinky towels. I use "OdoBan" in my final rinse. It makes towels, (and all my laundry) smell fresh wonderful. For stubborn musty odors in clothing, I turn off the washer, and let the final rinse soak for thirty minutes or so. It is inexpensive ($10 for a full gallon jug plus a 24 oz refillable spray bottle). It has too many uses to mention. It is not a masking agent. It eliminates all odors and kills 99.99% of germs. With six dogs, I wouldn't be without it. My child is always leaving towels lying around on the floor, or the furniture. They are never dry when she drops them where she does. I have found that if I put a Downy ball full of apple cider vinegar in the washer for the rinse cycle, it leaves the towels fresher longer, even when they are wet and lying on the floor. Source: I don't remember where I got this idea, but it has been many, many years. My facecloths were getting to the point of making me want to vomit from the smell they gave off once wet. I found that lots of people are having this problem. I noticed that it was worse if they were not left for enough time in the dryer! This all started when I started to use liquid washing soaps. So I went back to powder and hot water and a soak for facecloths, towels, and sheets. I also use a similar process for the dishwashing and cleaning cloths we use. I use gel Javex and powdered soap in hot water, to kill those nasty bacteria because cold water "does not" kill any of that. Well to my total amazement after the first wash all smells have disappeared completely. They are back to smelling like cloth should smell. I am so happy I got rid of it. Believe me, I tried everything (vinegar, soda, soda wash, and so on and so forth). I was thinking of buying new everything again, but I had changed everything last year. The problem is now solved, try it! Removing mildew smell from towels: Even, large, dark colored ones that can't be bleached. Soak the towels in 50% diluted tomato juice for two or three hours, run the wash cycle to be sure the towels are completely saturated, then rinse two or three times in cold water. Dry thoroughly. No more smell, even when wet. What am I doing wrong? My towels smell after washing, when I leave them in the basket down in the cellar. Will those new detergent boosters work? Fabric softener sheets do not seem to work. Vinegar is my solution for smelly towels and I have found that when I bought a front loading washer I was using way too much soap. I have cut way back and use the kind of detergent meant for front load washers but I still run all my washed clothes and towels through an extra rinse. By the way, do not use dryer sheets or fabric softener on your towels. That may seem odd, but the dryer sheets and fabric softeners make the towels not as absorbent, so they don't dry you off as well. My husband read about this tip in our local paper and I tried it and my towels are much, much more absorbent, yet they still feel soft in spite of not using a dryer sheet in the load! Why do my towels still smell after washing and drying immediately? Mine did too. Now I wash as usual but in the rinse cycle I put a splash of vinegar (1/4-1/2 cup) and the smell is gone. It removes all smells from the fabric and any leftover detergent. It softens too. The vinegar scent will disappear in the dryer cycle. Sometimes I do a second rinse with my liquid fabric softener. You can also use baking soda to remove this odor. I suspect it is caused by damp towels not drying out properly in the bathroom. That is what is the problem when my towels get stinky. If they are white towels you could bleach them. But do one or the other. Don't use multiple treatments at the same time. Ammonia will also take out this sour smell, but it will also dull the color of brightly colored towels, so I would not use it on nice bath towels, unless they were already white. Works just fine on kitchen tea towels, too. The city water dept. Told me that august is the time for algae bloom in all public water supplies from lakes especially; that we can expect that swampy odor even when drinking it. Perhaps vinegar kills the odors because the algae are alkaline and the vinegar is slightly acidic? I have noticed, too, that detergents are getting less powerful, not cleansing properly, but that vinegar and twenty mule team borax seems to improve it all? It may be that mfgrs are encouraged to weaken the detergents because of the big global environmental movement? Powders do a lot of harm to the water table, fish, and elements i hear. Liquids are more compatible and break down more naturally and completely in the sewage/water treatment plants. I have an HE machine and my towels kept smelling like mildew after I just washed them. I noticed my washing machine started smelling and so I went back to where I bought it and asked the salesman if he had heard of this problem before. He said that sometimes HE machines get some mildew buildup because the seal around the opening is water tight. He recommended I use a washing machine cleaning product. I found Tide Washing Machine cleaner at Home Depot. I used it and now my towels and machine don't smell anymore! I am a part-time seamstress and have found a new product (textile) that actually kills, bacteria, mold, mildew, algae, and other odor causing bacteria. I am a sceptic insomuch that I have a B.S. in Microbiology, so I bought a starfish for my kids to play with in the bathtub. I wanted to put it to the test. It has been in my bathroom in the tub for 18 weeks and it doesn't smell. I can hardly believe it. It works. I found the products at www.advancedecotex.com. Good luck. Hope this helps. I'm going to try the kitchen towels next. I've had this problem and tried bleach, hydrogen peroxide, vinegar, sanitize cycle but nothing seemed to work 100% - maybe just slight improvement at first, but then the problem just seemed to get worse. Yesterday I tried grapefruit seed extract which is anti-viral, anti-fungal, and anti-bacterial. I added some to my rinse cycle and clothes that I could not get the smell out of by using other methods (several times!) came out smelling wonderful!! I then put the grapefruit seed extract in my soap, bleach, and fabric softener dispensers and ran it through an empty cycle, then rinsed a couple times. The washer smells great! Today I washed another load of clothes which have had the stinky smell for a while and put grapefruit seed extract in the soap and rinse cycle and they also came out smelling great. I have never used fabric softener in this machine, nor do I used the fabric softener sheets and have still had this problem. 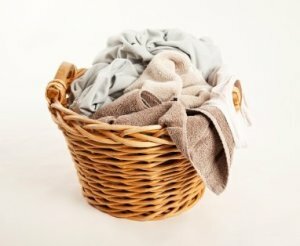 Not sure if this is a problem for some as suggested on this blog, but it is definitely not the only problem with front loaders and smelly clothes. I don't know if it's a factor in the problem, but I never had the odor with any other machine in the past, but the difference now is this machine is cold fill only. As every cycle automatically ends with a cold rinse, and the next load I put in always starts with a cold fill, I suspect bacteria is thriving in the 'innards' of the machine. I cannot afford to replace the machine at present, it's only just over a year old, but when I do purchase a new one I shall insist on hot fill. My towels actually smell ok when they are newly dried, but the second you start to dry yourself, the offending odor starts. I have also noticed same odor when I iron jeans etc. as soon as the steam contacts the fabric. I am now at the stage where I dread visitors using the bathroom in case they think I'm just re-drying used towels instead of washing them ! @BigChiefm1 you are a genius! I solved my stinky laundry problem by following your directions on how to clean the trap!! OMG, talk about some nasty stuff in there!! Mine had a bra underwire that had lodged in there and had a science project growing around it. Eeewww! I feel so much better knowing that all is clean as a whistle now in there and I didn't have to pay a repairman $200! Thank you, thank you, and God Bless you for posting such a wonderful tip! I had a similar problem and discovered that I wasn't getting my towels dry enough before taking them out of the dryer. They were getting a musty/mildewy sort of smell folded in the cupboard. Now, I leave them in the dryer (I use the highest heat setting) an extra 10-15 minutes after it says they are dry. The problem is gone. What can I put in the washing machine when washing towels and washcloths to eliminate a strange odor that occurs when using them. I have tried baking soda, Biz, vinegar, and cannot get them to smell nice and fresh. I would just use one of the new popular laundry detergents with the all the cool colors on the bottle and fancy named sent. They all smell wonderful. It's amazing how presentation and colors of something lures in consumers. Are you sure you are not letting your towels sit in the washer for a while when they are done? That could cause them to spoil and smell bad. I know. I'm guilty of doing it myself. If they are white, you can use chlorine bleach. It will take the smell out. If you are not concerned about the color of your towels, you can bleach them. They will fade, but they will smell fine. Ammonia also works, although I didn't find that it worked as well, and it also faded my dark green towels. Hanging the towels outside in the sun and wind should also help, after using one of the less drastic products. Towels and washcloths get this smell when they don't dry thoroughly after you use them. It is a tough smell to eradicate. I am battling the same problem at the moment, and have not yet solved it, as I am not ready to "fade" out my towels! And, I haven't tried the sunlight, as I have no clothes line. I wiped something up with a towel and did not realize it was garlic and washed it with the other towels now I can't get the smell out. What do I use to get it out? I have a problem with my water, I think. I wash a load of towels or dishrags, and they don't smell very good coming out of the dryer. Then when they get wet, they stink. I have tried everything I can think of bleach, hot water, etc. My clothes don't smell, it's only the towels, washcloths, and dishrags. I was raised on really fresh smelling towels, and I can't stand this. Our house is in the country and we have a septic tank, but we have city water, not well. Thanks for all the feedback. I wanted to let you all know that because of all the great suggestions, I hopefully have solved the problem. It was, in part, because of my front loader. I have used the HE liquid detergent since we bought them. The washer is water efficient, and my towel loads were too heavy, thus they weren't getting rinsed enough. I never did have any trouble with my clothes, only towels. I have a Whirlpool Duet washer and dryer and was having issues with all my clean laundry smelling moldy. I called the local hardware store (not a mega store) and spoke with the gentleman that sold them to us. He said he had had one other person call with this issue. A Whirlpool tech support told him to run 1 - 1 1/2 cups of Lime Away in the hottest, longest cycle I had on my machine. He also said to quit using liquid fabric softener because it just gums things up and to leave the door open when the machine's not in use. I did that and had to run it through an extra rinse cycle because the Lime Away created so many suds. Then we left the washer door open over night. The salesman/repairman also said to do this about once every six months. We have naturally very hard water here in the Midwest. Even with a water softener, things get gunked up with lime deposits. After reading everything here I re-washed a clean load of moldy smelling towels, with detergent, borax and then Odoban in the fabric softener dispenser. They smell nice and clean now. I even dampened one to see if I could bring out the moldy smell. But it still smelled great. I never did see any mold around the rubber boot/seal or anywhere I could look without having to tear the machine apart. I don't think its the front loaders. I've had the problem too with my top loader. Maybe be the liquid detergent. Could it be you are using too much? I ran the machine through a cycle with bleach. Allowed the drum to dry with the lid open. Problem solved in our house. Ran the machine on hot with bleach without laundry and let dry with the door open overnight. Next day did a towel load on hot with baking soda and vinegar along with the HE detergent. Mold smell gone, but slight hint of the vinegar. My wife was amazed. Decided to try 1/2 cup 20 Mule Borax with the HE detergent to see if I could get the same results without the vinegar smell. Towels came out perfect no smell at all just clean. We now wash everything with the Borax added and now everything is fresh. Wash cloths that are used for a few days in a row do not even develop the moldy smell. After trying different combinations of products to remove the smell from my towels, I finally found what works. I have a front loading washer and this is what I now do: 1/3 capful Arm and Hammer HE laundry detergent and 1/3 cup Arm and Hammer Super Washing Soda on the Heavy Cycle on the Warm/Warm setting. Then dry the towels on the highest heat setting for 75 minutes with no fabric softener. Towels if left wet, like after showers will mildew. Isn't your washer. It's simply cotton and moisture. That's why they sell white towels, you know the only kind your grandma used to buy. And white t-shirts for her husband to wear. She also had a bottle of Clorox bleach around. And separated her laundry. All my towels are fresh and clean. Another option is to put them out in the sun to dry or freshen. The sun will kill the mildew as well. Has anyone brought up the brand of towels that stink? I just wet several towels from our stack, with several different mfg's the ones that are the newest are the ones that stink, they are both the same brand. Maybe it is the dye or the material? We noticed the stink with both our old and new washers and we had it right away with the new washer so I really don't believe it to be a soap, mold, or build-up issue. We have always left the door open and Hey, our clothes don't stink when they get wet. We had issues with towels not smelling fresh right out of the dryer. After the first use (as soon as they got wet) they smelled very musty. Some clothing smelled a little musty, but not as bad as the towels. I contemplated installing a whole-house water filter because I thought it was a water problem. We have a LG high-efficiency washer, and our water really doesn't smell too bad. So we were stumped. Then I realized the smell started when we switched to liquid fabric softener from dryer sheets. We switched back to sheets and the problem went away, completely. We made no other changes, so I suggest you try this. I have no idea why this would be, but the liquid softener may affect how the load rinses, especially with the high efficiency washers. I'm sure it's too late for Robert Mastrion, I saw his post from 2007, Robert was moving his machine to the curb and starting over. Sorry Robert that this information comes too late to help solve your problem and save your investment, but hopefully it will help others. One thing that I've noticed reading all of the posts on stinky towels is that the chemical manufactures are loving this they must be having record sales, because of energy efficient front loading washers. Almost every post suggests adding some type of cleaning chemical to mask the problem. Over the last year I have seen a few others that have discovered the true problem with the washers, but it seems to fall on deaf ears. Even as we were having problems with stinky towels we were also having a problem caused by soap remaining in the cloths causing us to itch. When we finally admitted there was a problem with our new machine we started to try and find out what was causing it. We couldn't leave the door open to the washer because of mildew, at this point we realized that other things beside mildew could be growing in the washer; my wife even thinks this might be the cause of staph out breaks at times with schools using these washers to clean clothes in the athletic departments. Whatever problems stem from this other than stinky towels I'm sure cannot be good. Within a short period of time after we confronted the problem we realized the root cause was too little water used in the process of cleaning and rinsing the cloths. By adding water manually to the washer we were able to solve the problem in a short time. We determined that soap remaining in the washer and in the cloths was causing all of our problems. The gunk left behind in the washer drain system and in our cloths was providing the medium for growing who knows what in both the cloths and the washer. Once we realized this we knew we had to get more water add to the process, and at $4.00/1000gals, a little extra water cost a lot less than all of those chemicals required to mask the problem. You know a lot of that stuff your adding is being left in your cloths and getting cooked in by the dryer, just to be rehydrated by your body when you perspire. I spent a lot of time watching our machine wash cloths and began to think back to the days that we had a top loader. When a top loader rinses cloths there is a lot of water in the machine allowing things to be released from the cloths and be flushed down the drain, when it would spin the cloths would be held to the side of the washer drum and water would enter from the top of the washer and cascade over the cloths and then be extracted through the sides of the spinning drum and pumped out of the washer. This doesn't happen in a front loader, at least not mine, the water enters from the front of the machine to fill, well to wet the cloths and when it spins, water is not being cascaded over the cloths so that it can flush the soap and chemicals from the washer. We use every available rinse the machine will allow and then do a rinse and spin cycle after the wash which gets most of the soap out of the cloths. This was all well and good, we were proud of ourselves for determining the problem, but adding water manually during the wash and rinse took a lot of time. This is when I got back on the computer and started looking for help and help came while doing a Google search where I found a blog by some guy that had built a new control for his machine. The blog is called "whirlpool-dueling-with-duet.blogspot.com". While reading through this blog and shaking my head, knowing that I could never do this for my machine I ran across a reply from a guy that had read the blog and decided to try a different approach. This guy's solution was to make an adjustment to the device that controlled the water level in the machine and it only required a small screwdriver and two turns of an adjusting screw at which point our machine would fill with water on its own not requiring one of us to monitor the wash cycle and constantly add water. What a glorious day that was. Our machine could now wash a load of cloths without us and we could have our lives back on wash day. We still add extra rinse cycles to the wash and we run the machine through a rinse and spin cycle with the maximum number of rinses, but the small amount of water that we use extra is worth the price to have clean cloths again. Clean cloths without all of those extra chemicals. And hey we can leave the washer door open if we want to, because there is no bad smell anymore. I would like to thank Joe for his hard work in solving the problem and thanks to his blog we were able to save our machine and enjoy our investment. I hope this will help others solve the problem with their machines. My bath towels have developed a very bad odor! I've allowed them to dry before placing them in the hamper and they still have an awful odor in them. I don't have a problem with my washer making my towels and dishrags smell. It is the men in my house. If you use a towel, it is wet or damp and then leave it in a lump on the floor or bed, it will start smelling. I have a top load washing machine, nothing new and fancy. my towels come out of the wash with this smell and when they get wet again, it's worse. My towels always smell stale even after they have been washed. I tried baking soda in the washing machine but that didn't work. I need help getting that Funky smell out of towels. No detergent seems to do it.It seems like as soon as they get wet they smell dirty.